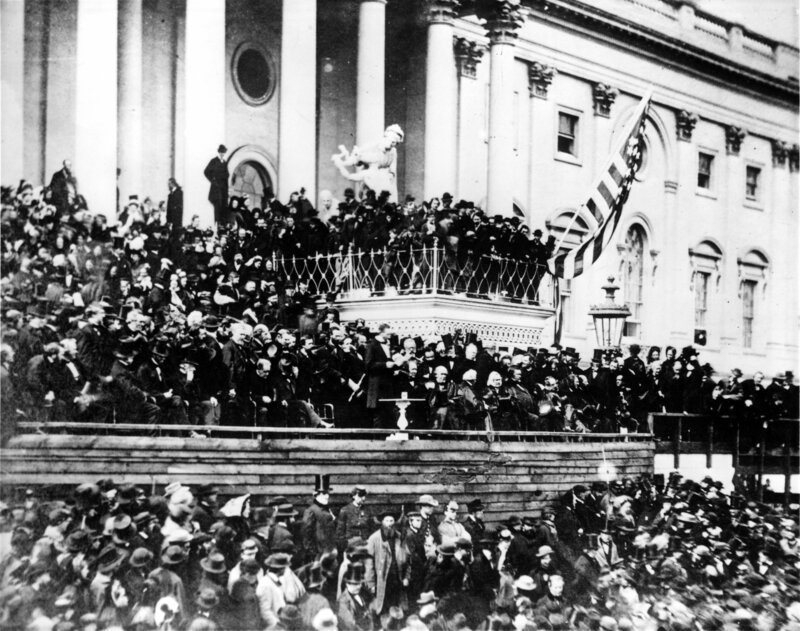 Today is the sesquicentennial of Abraham Lincoln’s Second Inaugural Address. That speech addressed ideological division and personal antipathy so severe that they had resulted in a civil war. Might Lincoln’s words from 150 years ago still speak to us today? “The progress of our arms, upon which all else chiefly depends,” Lincoln began, “is as well known to the public as to myself; and it is, I trust, reasonably satisfactory and encouraging to all. With high hope for the future, no prediction in regard to it is ventured.” Lincoln’s high hope would be realized in little over a month, when Robert E. Lee surrendered to U.S. Grant on April 9 at the McLean House in Appomattox, Virginia. At the time of the inaugural, victory was just around the corner, but not yet in sight. Neither, of course, was Lincoln’s assassination, which took place on April 14. Lincoln continued his address with a reminder of the cause of the war. “One eighth of the whole population were colored slaves, not distributed generally over the Union, but localized in the Southern part of it. These slaves constituted a peculiar and powerful interest.” Lincoln was not saying, it should be noted, that the Civil War began as a fight to abolish slavery. As Lincoln wrote Horace Greeley on August 22, 1862, “My paramount object in this struggle is to save the Union, and is not either to save or to destroy slavery.” The abolition of slavery became an explicit war aim on January 1, 1863, when Lincoln issued the Emancipation Proclamation. But at the outset of the war, preserving the Union, not freeing the slaves, was Lincoln’s stated goal. Because these clashing interests could not be resolved peacefully, “the war came.” Both sides expected “an easier triumph, and a result less fundamental and astounding” than the long slog of violence that actually ensued. In a nation of 32 million, 625,000 soldiers died—nearly two percent of the entire population! To put these military casualties in perspective, consider this: Civil War military casualties account for nearly half of all U.S. military casualties from the Revolutionary War to the present day. Lincoln began by noting the religious kinship of the North and South: “Both read the same Bible, and pray to the same God; and each invokes His aid against the other.” At a recent visit to a Civil War battlefield, I purchased replicas of prayer books printed for use by Union and Confederate soldiers. With minor exceptions, the prayer books are identical. The hymn selections—indeed, the very numbering of the hymns!—shows that opposing soldiers sang from the same hymnal. Fondly do we hope—fervently do we pray—that this mighty scourge of war may speedily pass away. Yet, if God wills that it continue, until all the wealth piled by the bond-man’s two hundred and fifty years of unrequited toil shall be sunk, and until every drop of blood drawn with the lash, shall be paid by another drawn with the sword, as was said three thousand years ago, so still it must be said “the judgments of the Lord, are true and righteous altogether” [Psalm 19:9]. Americans have become accustomed to presidents invoking God’s blessing on our nation, its interests, and even its wars. Lincoln was the rare politician who invoked God’s judgment against the very country he led. I can’t help but wonder whether Lincoln’s hearers were offended by his even-handed criticism of both the North’s and the South’s roles in the offense of slavery, not to mention his invocation of divine judgment against them both as an explanation for the war. Without giving an inch on “the right”—that is, on the North’s efforts both to preserve the Union and free the slaves—Lincoln called a nation still at war to replace “malice” toward its enemies with “charity.” He called on it to move from killing, and fighting, and war to healing, and caring, and peace. His words have a special relevance for Christian partisans because today—as in his own day—faith (or the lack of it) is a driver of ideological division. American Christians should seek to implement “the right” in public policy, “as God gives [them] to see the right.” We should be critical in our analysis of the “particular and peculiar interest[s]” that misshape our republic, even as we are cognizant of the interests that misshape us too. And we should be wary—as Lincoln was, and so many theologians in his day were not—of so easily invoking God’s blessing on our side. (On the North’s and South’s equally fervent but mutually contradictory Christian partisanship, see The Civil War as a Theological Crisis by Mark Noll.) With Lincoln, American Christians need to remember, “The Almighty has His own purposes”; “the judgments of the Lord, are true and righteous altogether.” They apply equally to us as they do to others. Finally, with Lincoln, American Christians need to remember that in all our controversies—some of which cannot be avoided, the goal of our actions is “a just, and a lasting peace”: the all-encompassing wellbeing which God created us to experience with one another, and through Christ, with Him. True peace requires that justice—“the right”—prevail. But it also requires that peaceableness—“malice toward none,” “charity for all”—be our stance toward others, even in the midst of our conflicts with them. Firmness in the right. Malice toward none. Charity for all. These are principles all Americans—especially American Christians—would do well to remember as they seek to influence the public square.